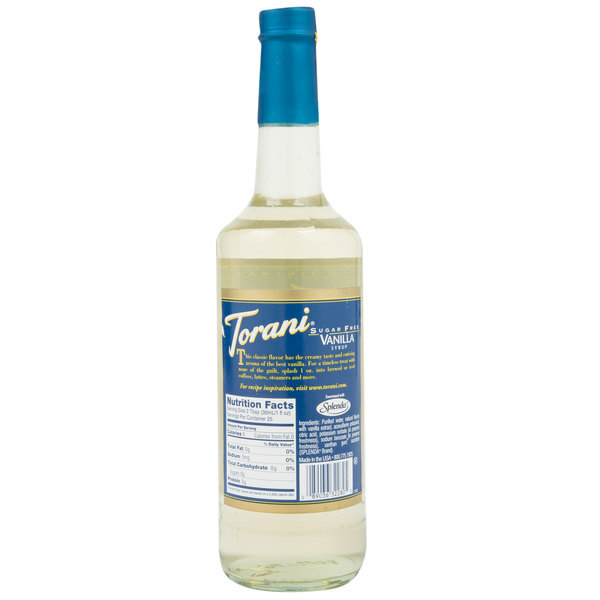 Bring all new flavors to your specialty drink menu with this Torani sugar free vanilla flavoring syrup! It's sweetened with Splenda brand sweetener, which offers the taste of real sugar without the calories. This tempting flavor will complement your beverages without overpowering them or being too sweet, while the user-friendly bottle will be convenient for your busy baristas to use. Torani flavoring syrups are specially formulated to resist curdling in milk and to hold up well under heat, making them the perfect choice for espresso-based drinks, brewed coffee or tea, and more. Use this flavor for frappes, iced coffees, smoothies, and even baking! One splash of flavoring syrup goes a long way, and this sugar free vanilla syrup perfectly blends the creamy, familiar flavors of smooth vanilla together in one bottle. Discover new Torani recipes for this vanilla flavoring syrup, including skinny sticky toffee latte, skinny vanilla creamtini, sugar free chocolate cream soda, and skinny cherry vanilla shake! Vanilla goes great with anything so i always enjoy being able to use this flavor to add sweetness without adding to much flavor so the customers palate isn't changed. This is a sugar free version which has a great taste. With this syrup our vanilla latte is the best in the competition, Great quality bottle. If your one to watch your carbs and sugar intake or medically have to watch and control your sugar then these Sugar Free syrups are exactly what you need. They don’t have none of that fake artificial taste like most have. Taste excellent in coffee and cappuccinos. Nothing better than blending in this sugar-free vanilla into a frappe and getting that perfect creamy consistency you expect without that sugar-free aftertaste that can get in the way. This is a great basic sugar free vanilla syrup. You can use it anywhere. Great dependable quality from Torani! One of the fastest selling flavors! Another fav for us! We use it on almost everything. Coffee drinks or desserts. Flavor is spot on. Hot drinks or cold, this vanilla will get the job done! So Great! I use this daily in my morning ice coffee frappes. Also use it to flavor ricotta cheese for a lo-cal sugar free dessert! 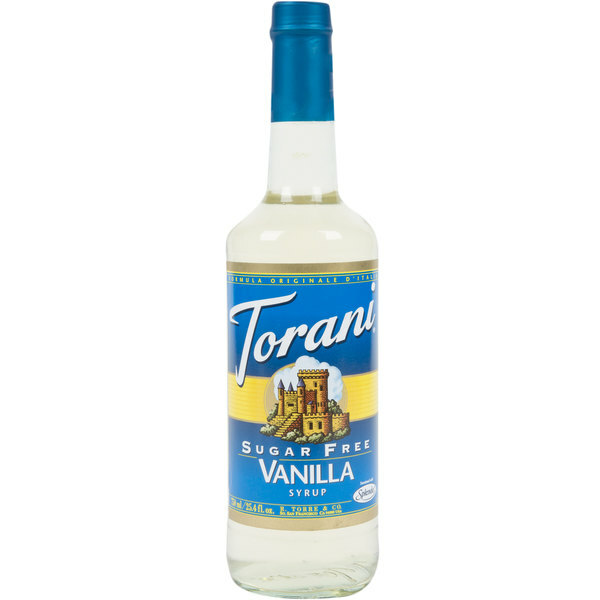 Torani has some of the best Sugar Free products in their line.... this vanilla syrup can be used for almost anything! Pairs great with a hot cup of coffee! Sugar free syrups are the best and Torani makes the best! This specific flavor is awesome. The overall quality is great. You will be happy with your purchase. My sugar free customers love this flavor! Can be mixed with other flavors too! Love that it comes with an extra seal so it doesn’t leak in shipping. Good quality and have bought many before. Will buy again when we restore. Thank you for a great price and product. Shipping was slow though. Good flavor for it being sugar free. Vanilla is very popular at our coffee shop and it is nice to be able to serve it sugar free! Many people as they get older can no longer have much sugar in their diet. It pays to have sugar free flavors to accommodate there needs. This syrup taste great and is popular. Great tasting the Torani Sugar Free Vanilla Flavoring Syrup is hands down on of the best on the market. You would never know it's sugar free. The price can't be beat anywhere. This syrup is a necessity for every coffee shop, it is a great sugar free option that still tastes great like the regular vanilla syrup. Classic vanilla flavour we use at home in various types of espresso drinks. The flavour is subtle and not too sweet which is a bonus. This isn't used as much as our regular vanilla syrup, but honestly its one of the best sugar free options I've found, both in taste and price. It's perfect for the break room. we always use this sugar free vanilla syrup! that is perfect enough to make a sugar free vanilla latte. our regular customer say our sugar free vanilla latte is the best!